We were planning to work on the insulation today, so after breakfast we dressed in our dirty work clothes and opened up the basement door. We found eight inches of water. 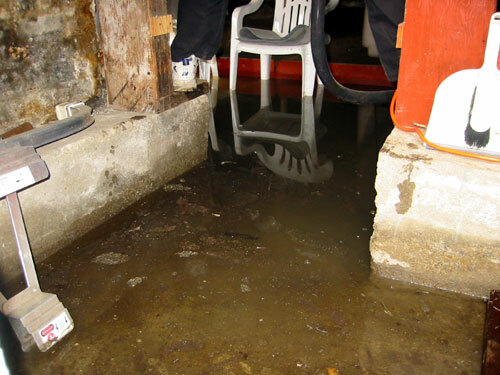 Fifteen minutes later, the sump had mostly drained it (bear in mind that only about 1/16th of our basement has concrete floors; the rest is sandy soil), and we decided to wait until it had had more time to dry before dealing with insulation over that mess. Instead we cleaned the floor, rearranged things that we have stored down there, and moved the grill and our little garden wagon down, as well. I also spent some time digging out the sump, which has sandy sides and collapses regularly. We had a moment or two of thinking fondly about what it will be like when we get the foundation replaced this summer. Still no sign of the painters, probably because it's been miserable most days and they can work inside at their other jobs. But I'm getting anxious to get this over with.